The 9 to 5 has prevented me from hitting full throttle on my blogging endeavours the last few months. I may finally have struck a balance between work and blogging. Over the next few months, I am going to write a number of posts on my favourite topic: The Universe. Mars water-scarred terrain - the planet has vast systems of canyons. In fact, the "Grand Canyon" of Mars is 5 times longer and 4 times deeper than the one in the U.S. These rugged terrains suggest the forces of water and glacial ice once at work. Needless to say, water is a key breeding ground and ingredient for life. Past existence of a rich atmosphere - Mars used to have a rich atmosphere which meant that it could sustain large bodies of water on the planet surface. As the atmosphere slowly disappeared however, so did the surface water. Abundance of carbon in polar ice caps - The polar ice caps on Mars contain large traces of dry ice. This means the planet also has a carbon store, the other ingredient known to all life. Mars was once geologically active - Mars' Olympus Mons is the largest volcano in the solar system. It is as tall as Mount Everest and as wide as Hawaii. Although the volcano is now dead, it was once believed to be fiercely active. Why is this relevant? A planet active in volcanic activities circulates the necessary minerals and nutrients to form life. Magnetic chains from Martian meteorites - Back in 2001, a four billion year old meteorite from Mars was found to contain microscopic magnetic crystals. The telltale crystals were arranged in long chains, which scientists concluded could only have formed by once-living organisms. Similar microbes currently exist in Earth's oceans, and the magnetic chains they produce are used for orientation relative to the planet's magnetic field. Could such microbes have existed in Mars? We know that Mars no longer has a planet wide magnetic field, but evidence from ancient rocks suggest a whole different picture billions of years ago. Discovery of methane from Mars - In 2003, large plumes of methane was discovered in the northern hemisphere of Mars. Normally, methane breaks down quickly under Martian conditions. The fact that these plumes exist in continual abundance suggests the planet is still geologically or biologically active. Some organisms release methane when digesting nutrients. Oxidation of iron however can also release methane. Indeed, the rusty crust is what gave Mars its nickname. The list of pro-Martian-life arguments can go on for a while. Where would life be if it were to exist on Mars? It is now widely believed that any life forms on the planet may be confined deep underneath the crust, where it is still warm enough for liquid water to exist. 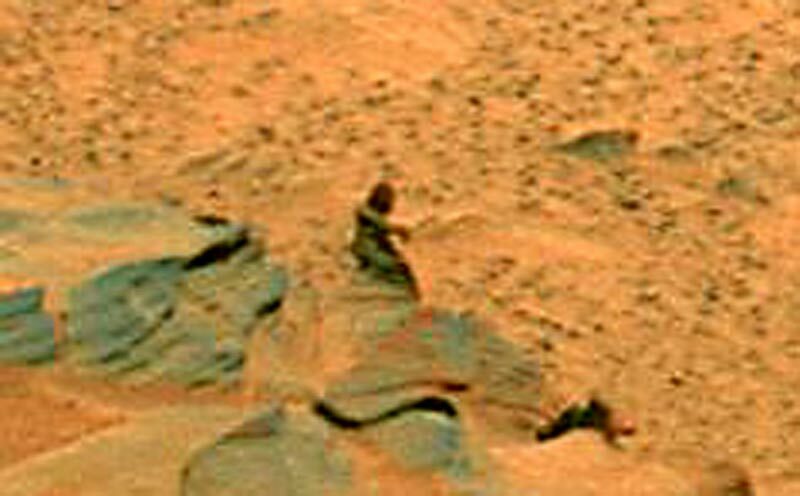 After all, the ape-like figure in the image is nothing more but a pile of Martian rocks.